The year is 2025. Decades of underfunding, corruption, and a lack of preventative maintenance have left Pittsburgh's water infrastructure in a state of crisis. Lead levels are rising as century-old pipes corrode, but the government has little information about the source or the scope of the contamination. Concerned residents have no way of of knowing if their drinking water is safe, and many remain unaware of the epidemic nature of the problem. That's where safe2o, a startup specializing in smart water filtration and data analysis, comes in. safe2o brings to Pittsburgh a combination of products and services that meet the needs of multiple stakeholders. The system consists of a smart IoT water filter and sensor, combined with tools to help both the government and the public access and understand the data it collects. The foundation of the safe2o system is a product: a smart IoT (Internet of Things) water filter. It attaches to a household sink and gives the user up-to-date data about the quality of the water running through their pipes and the effectiveness of its filtration system. The filter includes a low-power ambient display that depicts contaminants and the filtering process in an engaging, illustrative format. However, filters alone can't solve an infrastructure crisis. Without the data they collect—valuable information about the level of various contaminants in residences—the filter is just a band-aid. Safe2o provides tools to serve that data in targeted and useful ways to the government, residents/homeowners, and the general public. Lead is the single most dangerous contaminant in Pittsburgh's water, but one of the hardest to detect and eliminate. Lead leaches into drinking water from the corrosion of old lead pipes, which must be replaced. Contamination can stem from any point in the system, from the reservoir to the pipes inside individual homes. In the past, the government had limited date about the source and even the amount of lead contamination—its information came from annual testing of selected sites and a limited supply of test kits which residents could request by mail. When multiple people in a neighborhood install a safe2o filter in their homes, it creates a network of sensors, allowing the government to precisely pinpoint the source of lead contamination. If only one house on a street is contaminated, the problem comes from the pipes in that home, but if the entire street or neighborhood shows lead contamination, the source is further out. Safe2o's education tool provides information to help residents interpret and act on their data. It includes resources for people who own filters and people who don't, including neighborhood-level overviews of the city's water quality, explanations of contaminants and their significance, water safety tips, and information about the source of residents' water. Unlike the government, residents wouldn’t benefit from address-specific information about contamination levels (outside of their own home), but aggregate data about the state of Pittsburgh's water can help create awareness and put pressure on the government to fix the problem. With enough localized sensors, it becomes possible to create a generalized picture of the quality of water in a neighborhood. Safe2o's AR stickers embed that data in the built environment, encouraging people to engage with the system and maintain an awareness of the quality of water outside their own home. Scanning a sticker with a smartphone brings up location-specific data about the water quality in the user's location. Safe2o partners with the Pittsburgh government and charitable organizations to distribute and sell filters and implement its data analysis tools. Initial Research: Viewing water as a wicked problem. We began by mapping all of the individual pieces of the problem, the stakeholders involved, and the connections between them. We grouped those problems into categories using the STEEP framework: Social, Technological/infrastructure, Economic, Environmental, and Political. Where does Pittsburgh's water come from? How does it get to people's homes? Who is responsible for making sure Pittsburgh's water is safe? How are they held accountable? How do people know if their water isn't safe? What actions can they take in response? Who cares about this problem? What is their stake in it? What are their goals, aspirations, and fears? Which stakeholders agree, and which have conflicting goals? What might the world look like in 2050? How would that affect this problem space? What would the future look like if access to clean water were solved? What steps or events would lead to that preferred future? What changes must be made to avoid less preferable futures? As part of our deep dive into futuring, we created artifacts from the future scenario we imagined. I designed a piece of advertising from Coca Cola in 2050, reflecting a shift in the world's values. As natural resources become more scarce due to forces like climate change and overpopulation, water becomes a commodity. 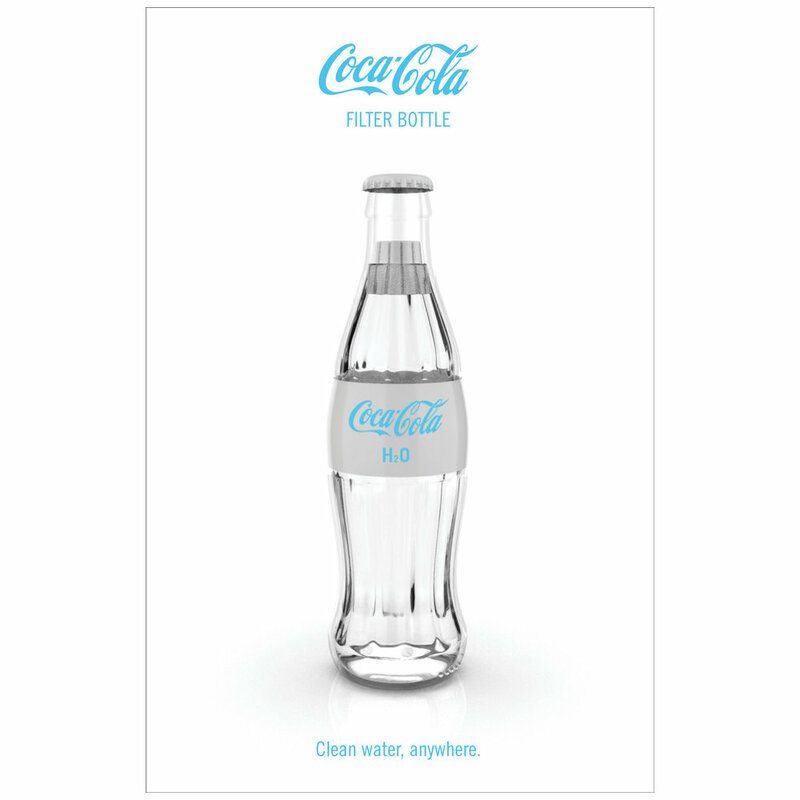 Where Coca Cola once positioned its products as a more luxurious alternative to water, it now uses the image of clean water as a marketing tool and a status symbol. This image represents a future in which clean water is no longer taken for granted—an idea worth taking into account when designing clean water solutions for the future. With research progressing, we began to sketch out ways that we could intervene in the system to create change. One of my initial proposals was a filter to promote water visibility. Since water contamination is usually invisible, I proposed a filter (represented by this mockup) that would display information about contamination, overlaid directly on the water you were about to drink. We later merged this concept with the idea of a smart network of sensors. We explored many directions before narrowing our scope. Another early concept featured a series of public water access points, linked to specialized water bottles, that would increase access to clean water in places lacking reliable water infrastructure. After brainstorming possible interventions, we narrowed to a central theme: water visibility. We realized that most of the problems we had identified stemmed from a lack of awareness and understanding. Contamination, especially lead, is often totally invisible to the average person, since it doesn't change the appearance of seemingly potable drinking water. The troubled network of pipes beneath Pittsburgh's streets is also out of sight of most residents, leading to a lack of public pressure on the government to fix infrastructure problems and causing the public to underestimate the scope of those problems. We sketched out a design solution centered around a smart IoT (Internet of Things) water filter and sensor. We envisioned a two-part system: the filter would provide individual residents with peace of mind and information about their water, but it would also collect data that could be used to educate and inform the public and the government, contributing to long-term solutions. I sketched out an early version of the augmented reality interface. We decided on AR as a medium because it made more sense for exploring street-level data than a top-down map. In this proposal, residents would be able to walk through their neighborhood and see usually invisible information, like the source of pipes and the level of contamination by house. Later, we realized that address-specific data about contamination, while engaging to explore in AR, was not helpful for residents to have access to, and might actually foster shame or competitiveness among neighbors. I worked on adapting this tool to provide information to the general public for the final product. I created this mockup of a government dashboard to illustrate the concept of using a network of IoT sensors to pinpoint the source of contamination. My teammate Steven Ji later developed this into a fully fleshed-out interface. My teammate Sara Remi Fields created these wireframes to explore the kind of information that we could provide to Pittsburgh residents and the best way to present it. At the end of the project, we created a variety of artifacts to showcase our proposal. I primarily worked on the augmented reality experience and the adoption timeline.